ABSTRACT — After some years of careful planning, in 2013 Lebanon was on the verge of launching an auction for the first licensing round in relation to its offshore natural gas potential. Two decrees, one related to the division of the Lebanese economic exclusive zone (E.E.Z.) into 10 blocks, and one related to the exploration and production agreement (E.P.A. ), i.e., the petroleum contract that Lebanon wants to sign with the international energy companies interested in Lebanon's hydrocarbons, were the prerequisite for the auction. Unfortunately, the government has never approved these two decrees, and the auction has been postponed since then. The aim of this paper is to analyze the importance of these two degrees with a particular attention given to the E.P.A. degree with its related fiscal issues. BEIRUT, Lebanon — In July 2015 the question of the demarcation of the maritime border with Israel has one more time been brought to the limelight of Lebanon's political debate. 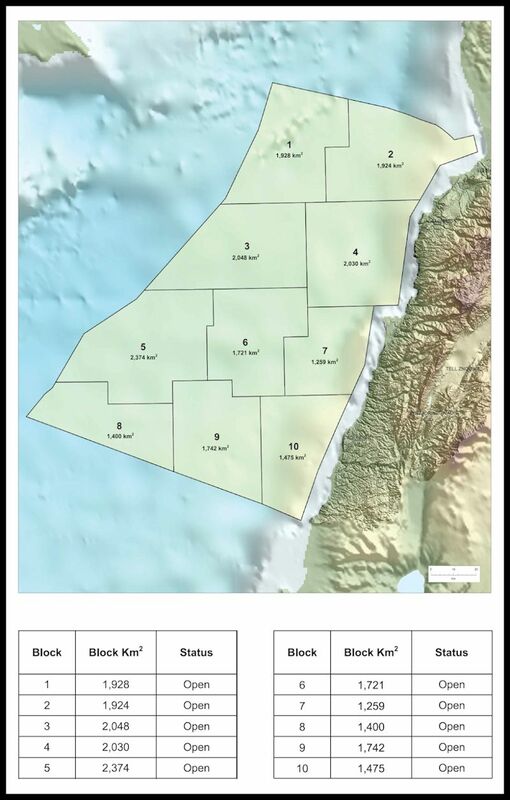 At the beginning of July, during a visit to Lebanon, Amos Hochstein, the U.S. special envoy for international energy affairs at the State Department, reaffirmed that if Lebanon intends to start developing its offshore oil and gas reserves it has to deal with the complex issue of the maritime demarcation with Israel. Acouple of weeks later, Energy and Water Minister Arthur Nazarian expressed its hope that the U.S. may consider a Lebanese request to have the U.N. help demarcate the maritime frontier between Lebanon and Israel where there could be natural gas reserves buried beneath the seabed. In specific, Israel and Lebanon quarrel as for a maritime area of 874 square kilometers. In July 2010, Israel defined and adopted a delineation of its exclusive economic zone (E.E.Z.) that conflicts and overlaps with Lebanon's E.E.Z. The state of war between Israel and Lebanon, at least technically speaking. The Israeli-Lebanese relations have never existed under normal economic or diplomatic conditions, although Lebanon was the first Arab League nation to show a desire for an armistice treaty with Israel in 1949. After the 2006 Lebanon War (in Lebanon a.k.a. July War), which ended in August 2006, Israel and Lebanon have not been fighting anymore — apart from some border incidents once in a while — but still a state of war is the technical current condition between the two countries. The tense relations between the Republic of Cyprus (Cyprus proper) and Turkey in relation to the division of the island of Cyprus between the Republic of Cyprus, which is recognized at the international level, and the Turkish Republic of Northern Cyprus, which is an entity recognized only by Turkey. With reference to Cyprus' offshore energy activities there is an overlapping between some of the Republic of Cyprus' oil and gas research blocks (blocks number 1, 4, 5, and 7) and Turkish continental shelf claims. The maritime border dispute between Israel and Lebanon is not easy to solve. While Lebanon ratified the United Nations Convention on the Law of the Sea (Unclos) in January 1995, Israel has never signed nor ratified Unclos. In practice, this means that the only possible road in order to solve this matter is for Lebanon third party mediation possibly through the United Nations (U.N.). In fact, in no way may Lebanon force Israel to court (for instance, the International Court of Justice (I.C.J. ), the International Tribunal for the Law of the Sea or the Permanent Court of Arbitration) because there is simply no jurisdiction applicable to Israel. It's clear that this territorial dispute will impede Lebanon from developing its hydrocarbons buried beneath the seabed under the above mentioned 874 square kilometers. And, if, on the one hand, it's true that "[p]roclaiming an E.E.Z. is now part of customary law, as made by international lawyers, and therefore opposable even to States not partied to Unclos like" (Meier, 2013), it's also true that for two countries in a state of war it's difficult to reach an equitable agreement on the basis of international law (for instance, the equidistance line from the baselines between the countries). With reference to block delineation, a final but important consideration is that a government has never to award all of its offshore and/or onshore territory for exploration and exploitation simultaneously; this rule is particularly true when a government is awarding unexplored acreage with many unknown factors involved. In fact, especially when dealing with frontier territory, designing immediately an almost perfect contractual framework with its related fiscal terms is practically an impossible task, so it's much safer for a government to award its territory in a gradual manner utilizing for every new award the information obtained through the previous exploration and production agreements (E.P.A.s). Currently, Lebanon's offshore gas dossier is not progressing at all (For more information see: BACCI,. A., Lebanon's Offshore Natural Gas: A Complicated Story, May 2015). In order to advance with the gas business, it is necessary that the government approves two decrees: the first one concerning the demarcation of the 10 maritime blocks (the division of the exclusive economic zone) and the second one concerning the details of the production sharing agreements (P.S.C.s) to sign with the I.O.Cs. Without these two decrees it is not possible to have the auction for the assignment of the blocks — an auction which has been postponed several times since October 2013. In July 2015, all this attention and interest given to the necessity of finding a solution to the maritime border before drafting the decree related to the Lebanese E.E.Z. do not seem very economically rational, if Lebanon is fully committed to exploring and later exploiting its offshore gas potential. In 2010, the U.S. Geological Survey estimated that the Levant Basin could have 122 trillion cubic feet (TCF) of undiscovered natural gas resources and 1.7 billion barrels of recoverable oil. Thanks to recent discovery of natural gas offshore, both Cyprus (Aphrodite 7 TCF) and Israel (Tamar field 10 TCF and Leviathan field 18 TCF) have the potential to become natural gas exporters. Indeed, Lebanon, which according to Spectrum, a Norwegian company working in the seismic services market, could have up to 25.4 TCF of recoverable offshore gas reserves, is already quite late if it intends to develop its offshore potential — if Lebanon started developing its offshore sector now, it would not be able to export gas before 2025. 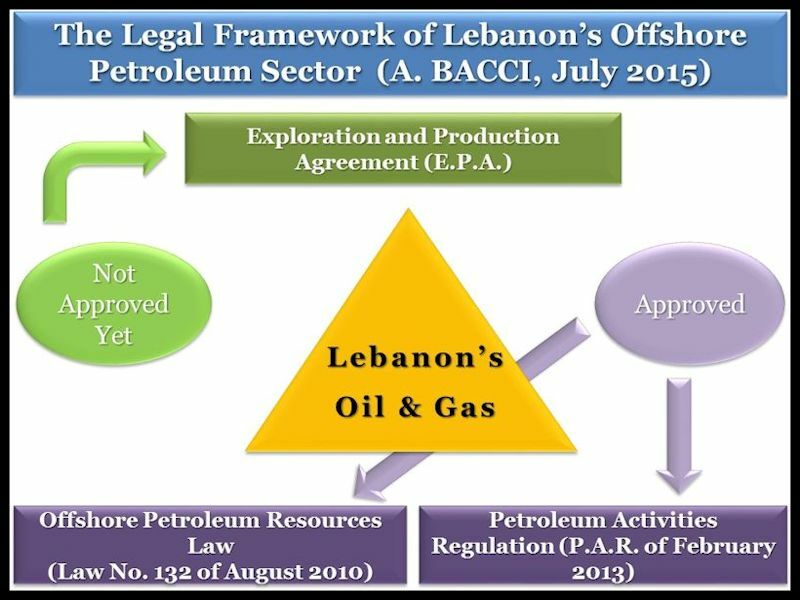 If the two above-mentioned decrees are not passed because there are some doubts about the economic side of the development of an offshore natural gas sector in Lebanon, this kind of substantiated opposition is perfectly acceptable and could be logic (of course, it needs an explanation). But, if the two decrees do not advance for political reasons, this does not serve the long-term interests of Lebanon. And the reemergence of the problem related to the maritime border with Israel appears as a new (ad hoc formulated) stumbling block capable of delaying the advancement of Lebanon's offshore gas dossier while it could be possible to draft the E.E.Z. decree with the precaution of not exploring within the disputed area. 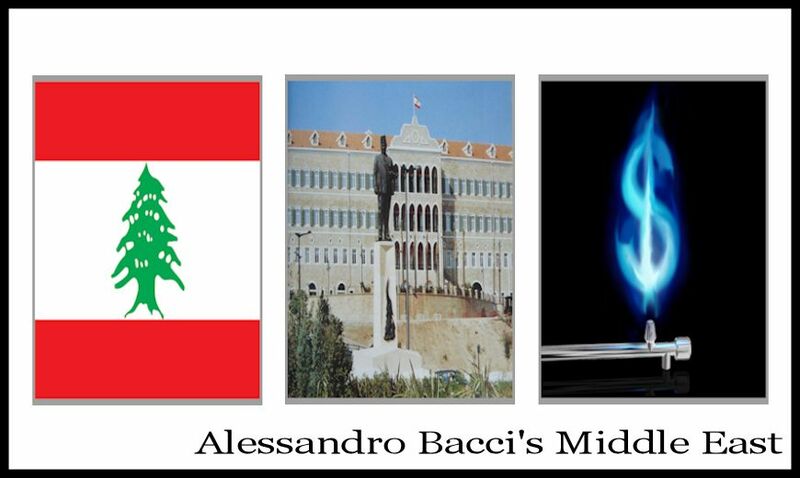 Now, it is not anymore confirmed that all of the 46 companies (12 as operators) that prequalified for the auction will continue to show interest for Lebanon's natural gas (For more information see: BACCI, A., Forty-Six I.O.C.s Will Bid for Lebanon's Offshore Hydrocarbon Exploration, April 2013). Until the moment when it was supposed to pass the two mentioned decrees, the Lebanese government had acted in a correct manner. Uncertainty about the geological potential embodies the lion's share of the risk associated with a petroleum project. And starting a 'negotiation' with I.O.C.s — by the way of an open-door system (negotiations between the government and interested investors through solicited or unsolicited expression of interest) or through licensing rounds (administrative procedures or auctions) — with scarce geological information means starting off on the wrong foot, highly increasing the probability of being forced to renegotiate the signed contracts quite soon. So, in light of these concerns, ahead of licensing exploration and production rights, the government had contacted Petroleum GeoServices (P.G.S.) and Spectrum, two companies active in the seismic service market. These companies extensively mapped offshore of Lebanon with 2-D and 3-D seismic surveys (around 70 percent), and, through the acquisition of geophysical data, which can be sold to the interested I.O.C.s, they lowered the geological risk and increased the interest (and consequently the competition) among the potential investors (recently the government has replicated the same scheme onshore of Lebanon with a U.S. company, Neos, which has completed a geophysical airborne survey designed to map the regional prospectivity of 6,000 square kilometers, including the onshore northern half of the country and the transition zone along the Mediterranean coastline, by integrating legacy well and seismic data with newly acquired airborne geophysical datasets). 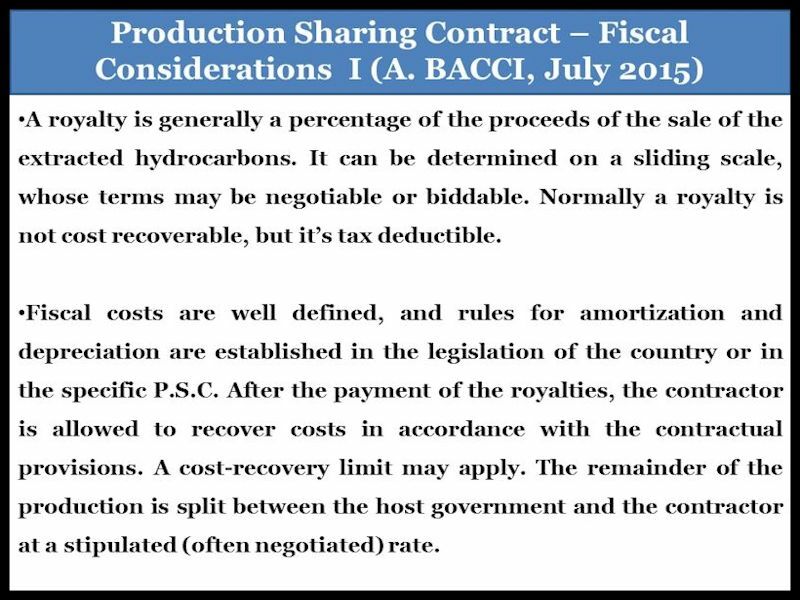 For the I.O.C.s interested in the offshore hydrocarbons, right now the real stumbling block is the absence of a final (adopted and signed) Exploration and Production Agreement (E.P.A. ), which is the essence of the second degree that the government has to approve yet. Under the current available data, it's difficult for an energy company to accurately assess whether to invest in Lebanon's offshore activities. In fact, when in June 2013 was held a meeting between prequalified consortia and the Lebanese Petroleum Administration (L.P.A. ), the involved I.O.C.s raised many complaints in several different areas: exploration phase, force majeure, time for proposing a development plan, and political risk. The O.P.R.L. regulates reconnaissance, exclusive petroleum rights and the exploration and production agreement between the Lebanese State and the right holders. 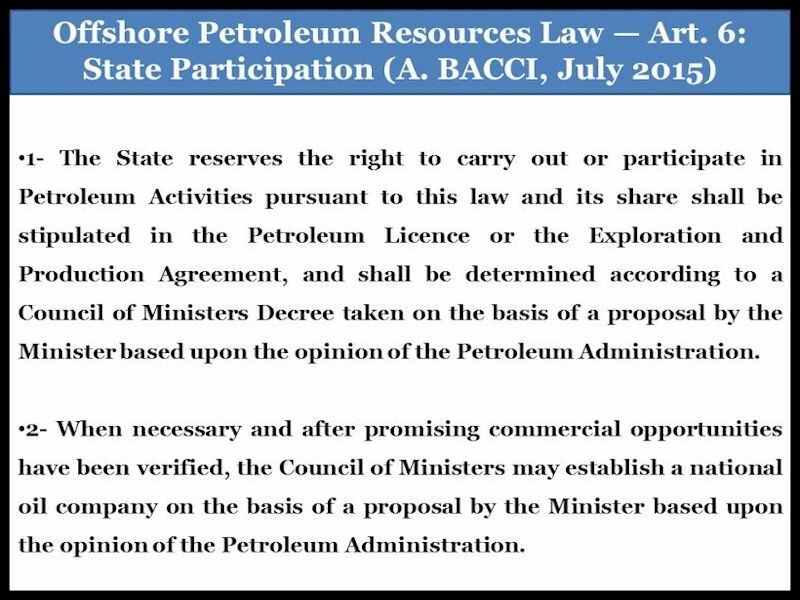 According to this law the Lebanese State reserves the right to carry out or participate in petroleum activities. The proceeds arising out of petroleum activities shall be placed in a sovereign fund. 2) The Petroleum Activities Regulation (P.A.R. ), also available online on the website of the L.P.A. The P.A.R. presents the applications decrees for the O.P.R.L. It covers several rules stipulated in the law. The P.A.R. provides the regulations pursuant to conducting petroleum activities including: the legal representation of the right holder, the management system, the general duties of the operator and the right holder, the strategic environmental assessment, the exploration and production rights, the petroleum production and transportation, the cessation of petroleum activities and decommissioning, and other activities. For I.O.C.s, together the articles of the O.P.R.L and of the P.A.R.s surely provide some fundamental information in order to understand how to work in Lebanon's offshore waters. But, without a definitive E.P.A., which has to include all the biddable and non-biddable terms, for I.O.C.s it's difficult to economically evaluate the pros and cons of investing in the development of Lebanon's offshore natural gas. Presently, in relation to the contractual part, in addition to these two documents, on the L.P.A. 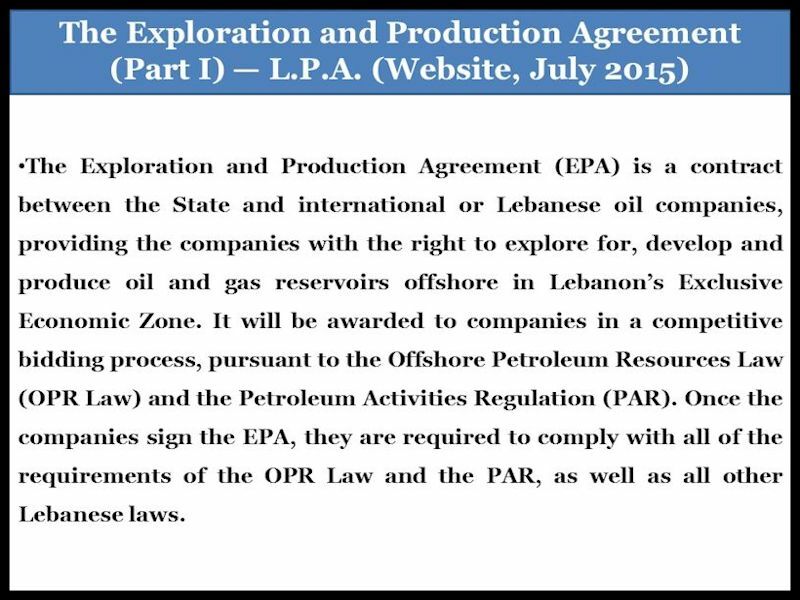 website there is only a page titled "THE EXPLORATION AND PRODUCTION AGREEMENT" where there is just some preliminary and basic information about Lebanon's future E.P.A. 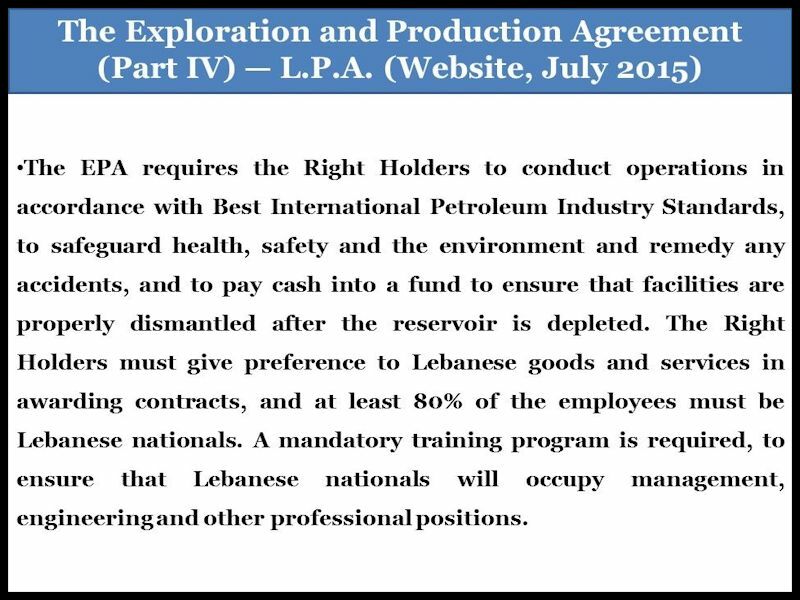 The pre-qualification criteria that the country [Lebanon] selected clearly created a bias toward large oil companies, the rationale being that Lebanon’s oil and gas resources lie in deepwater and the larger players have the expertise and capital to exploit them. In practice, when a country defines its prequalification criteria, it indirectly orients the kind of E.P.A. (contract) that the prequalified companies will accept and sign later. 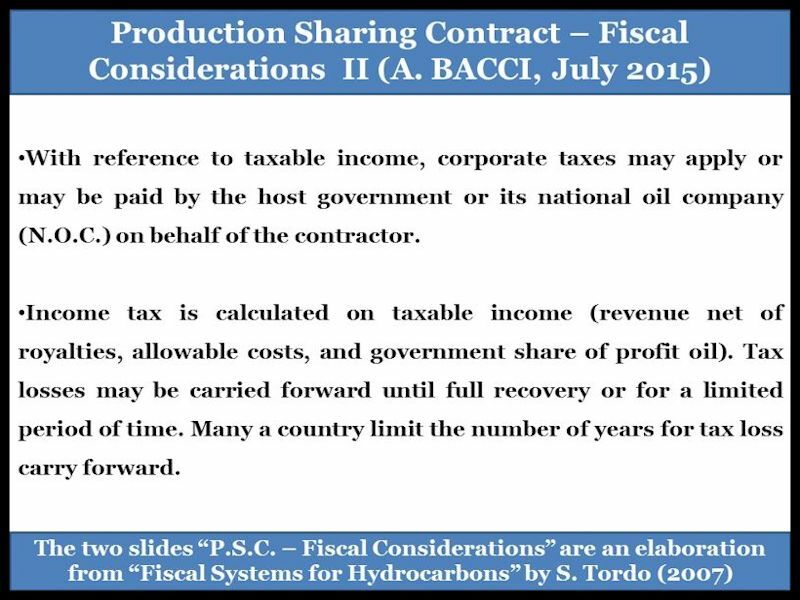 The idea is that, if a country delineates prequalification criteria targeting for instance large petroleum companies, later when it writes its E.P.A., it will have to draft a contract with fiscal parameters in line (or at least partially in line) with the desiderata of large petroleum companies — if the government does not proceed so, it will have probably nullified the prequalification results, and it will have to start the process for a second time. 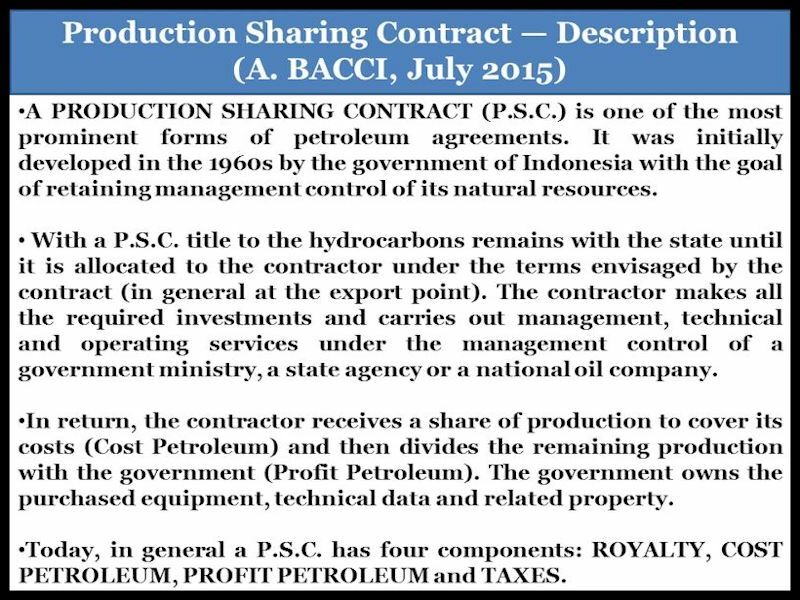 Lebanon has opted to sign Production Sharing Contracts (P.S.C.s). The slides below provide some details concerning the structure of today's general P.S.C.s. The scheme released by the L.P.A. shows that Lebanese P.S.C.s are well in line with the most basic form of a classic P.S.C., which has four components as shown by the table below. THE FOUR MAIN COMPONENTS OF A CLASSIC P.S.C. In addition to the four mentioned components, the O.P.R.L. Art. 6 (State Participation), affirms that the state maintains the right to carry out or participate in petroleum activities. Apparently, the state participation option will not be part of Lebanon's first licensing round. So, presently, there is no state participation in the E.P.A. at the time of award, but, the state or any entity owned by the state could in the future become a right holder pursuant to additional assignment rules, and early termination and forced assignment rules. At the time of this writing, state participation has yet to be defined. And, until now, petroleum literature has not been able to demonstrate that direct state participation provides some additional benefits that could not be achieved from taxes — many a time states decide to participate on the ground of non-economic considerations, e.g., control, technology transfer, national pride. For sure, for a state, state participation augments administrative complexity and risk, while for the investing I.O.C.s, it represents a cost and sometimes the implementation of suboptimal decisions concerning the hydrocarbons development. So, for a country as small as Lebanon, the benefits of establishing a national petroleum company are not so evident. Summing up Lebanon's proposed E.P.A. should consist of four or five elements. In light of the presence of a royalty, some commentators see the Lebanese P.S.C. as a hybrid between a concession and a P.S.C. This is an opinable point of view because most of modern P.S.C.s have a royalty included. Moreover, governments have the objective of maximizing the value of government revenues in their petroleum arrangements with I.O.C.s. and they can reach this goal through whatever petroleum arrangement they decide to sign: concession, P.S.C., and service contract. The E.P.A. seems to primarily recall the definitions set forth in the O.P.R.L. and the P.A.R. So, as defined in Art.1 of the O.P.R.L., the E.P.A. is "[a]n agreement concluded between the State and no less than three Right Holders". A right holder can be a single company or a group of companies in which at least one meets the prequalification eligibility criteria set forth in the Pre-Qualification Decree. One of them is the operator (with at least a 35 percent participating interest, while non-operators have a minimum 10 percent participating interest), responsible for carrying out day-to-day activities, although all right holders are jointly and severally liable for their obligations. The idea of an unincorporated joint venture (U.J.V.) is quite common in petroleum ventures, while it's unusual in the mining sector where major companies own majority stakes in locally incorporated vehicles. U.J.V.s serve the interest of both governments (more involved actors) and I.O.C.s (more flexibility). Art. 12: Awarding Rights 2/a determines "an Exploration Phase not exceeding ten years". Art. 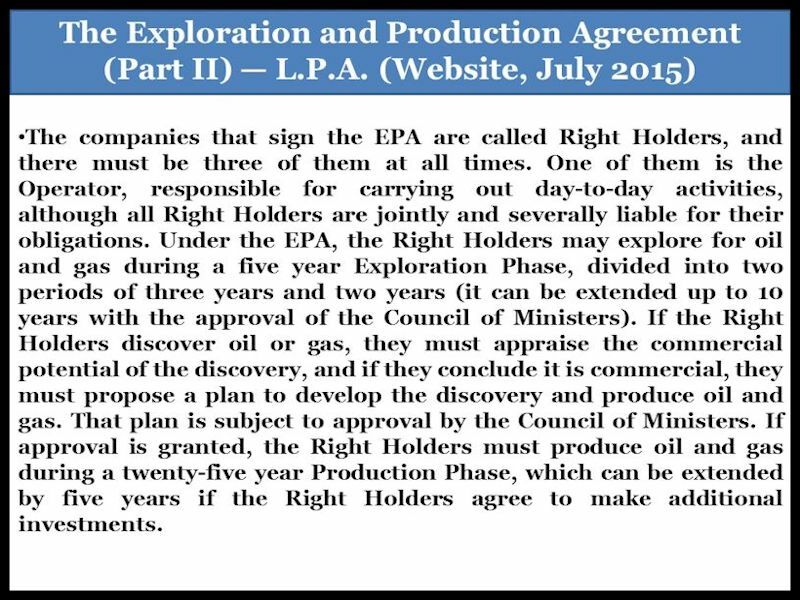 21: Extension of the Duration of an Exploration and Production Agreement determines that "If the Exploration phase, provided by the Exploration and Production Agreement is shorter than ten years, the Council of Ministers may, upon an application submitted to the Minister, and on the basis of a proposal by the Minister based upon the opinion of the Petroleum Authority, extend the Exploration phase within the ten year time limit". With reference to the percentages for acreage relinquishment, the legislation envisaged for Lebanon follows current practices with P.S.C.s — see, for instance, in the Kurdistan Regional Government (K.R.G.) where P.S.C.s. call for the same percentages although with a partially different time frame: an initial period of five years (divided into two sub periods of three years and two years like in Lebanon) extendable for two additional years up to a total of seven years. In fact, in Lebanon, at the end of the first period, right holders will relinquish 25 percent of the block, and, if later there is an extension to the exploration phase, they will add an additional 25 percent relinquishment (at that point relinquishment will amount to 50 percent). According to the L.P.A., for natural gas there will be a royalty with a flat rate at 4 percent — instead, with reference to oil, Lebanon wants to implement a flexible royalty rate between 5 percent and 12 percent in relation to a sliding scale linked to daily oil production. Some analysts deem the royalty rate for gas as too low, while others would like to avoid completely the royalty, which of course is a regressive instrument. Indeed, these are two opposite points of view. But the reality is that they both probably misread the overall structure of a petroleum contract — in this case a gas contract. The slide above provided a detailed explanation of what a royalty is today, but some additional notes concerning Lebanon may help. A royalty is surely regressive (regressivity is intrinsic to the concept of royalty no matter how we may formulate it), but it serves the purpose of a government that wants to obtain a cash flow soon — and Lebanon needs to obtain some profits quite early. 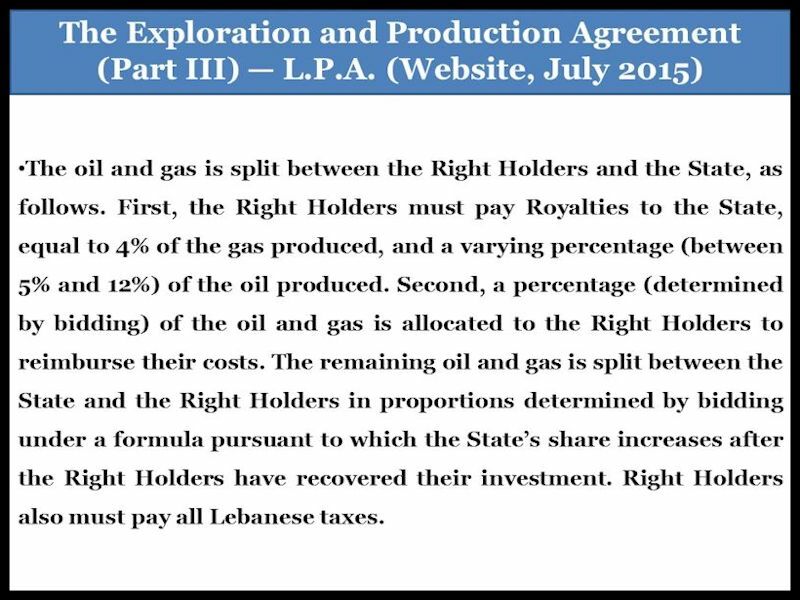 At the same time, because this royalty is not very high (it's true that it's a natural gas royalty and not an oil royalty, which is always higher) so it's not an excessive fiscal burden for the I.O.C.s that want to invest in Lebanon. But, as usual, when drafting a petroleum contract every single element has to be aligned with all of the others. 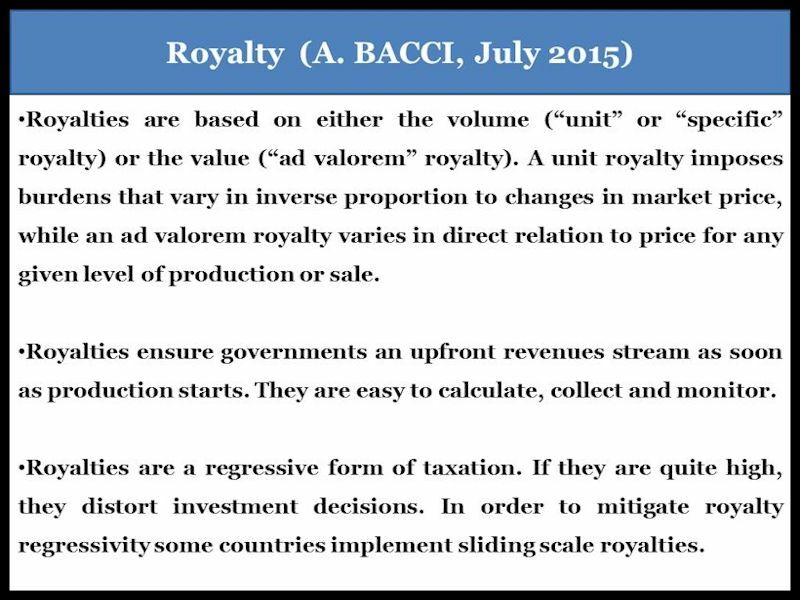 A perfect royalty rate does not exist, and analysts should evaluate a royalty rate in relation to the other parameters present in the contract. What matters is the final result. The L.P.A. says that "a percentage (determined by bidding) of the oil and gas is allocated to the Right Holders to reimburse their costs". Also this element is the kernel of a P.S.C. After paying the royalty, the next application of the production is given to the contractor in order to recover its costs. Usually, there is an upper limit (a.k.a. ceiling), let's say for instance 40 percent of production, which may be used every year for cost recovery. At least, the contractor's costs include all capital costs (CAPEX) and the annual operating costs (OPEX) — let's put aside other elements as interest on debt (not always allowed) and investment credit. Without an upper limit I.O.C.s could quickly recover their costs and have a reduced payback period, but, at the same time, this would run counter the interest of the hosting government, which would see its initial revenues postponed to a later time. A cost recovery limit is less regressive than a royalty. 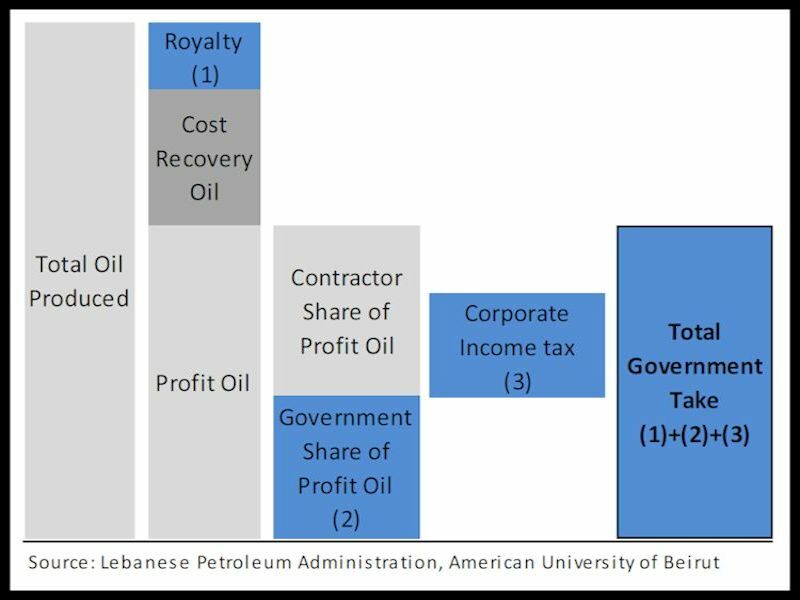 In Lebanon, every quarter, profit petroleum, i.e., the production not otherwise allocated to cost petroleum and/or royalty, will be evaluated on a biddable sliding scale that is related to profitability (an R-factor for the immediately preceding quarter). The following table shows the percentages of profit petroleum implemented in relation to the R-factor. The structure utilized by Lebanon is similar to the formula utilized by Iraqi Kurdistan. The only difference is that the Lebanese definition " = to RB " present in the third row is moved up to the second row in the K.R.G. P.S.C.). It is unusual to see the minimum profit sharing biddable especially since it can lead to a wide range of minimum government takes, thereby increasing the administrative burden and complicating revenue forecasting. Lebanon can improve its system by fixing the lower band of its share of profit petroleum and allowing companies to bid for two more upper tiers. The advantage of this approach is that it ensures a minimum government share of profit petroleum, rather than solely relying on the bidding process. Yes, a biddable minimum profit-sharing percentage means that for every signed E.P.A. there could be a different minimum profit-sharing percentage. Administratively speaking, especially for a country new to the petroleum business this could create a real mess. Instead, an already decided minimum percentage could give more stability to the country's revenues. The future E.P.A. has necessarily to clarify the rate of the Corporate Income Tax (C.I.T.). The L.P.A. in a simplistic manner affirms that right holders must pay all the Lebanese taxes. It's possible that Lebanon will use also the general income tax, which has a 15 percent rate, but until now it is not clear what the L.P.A. and the Ministry of Finance will decide. Again, administratively speaking, it's easier for a country to manage a single general C.I.T. for all the business sectors than to manage the general C.I.T. together with a specific petroleum C.I.T. If the C.I.T. is fixed, corporate taxes are relatively regressive, i.e., their burden stays the same notwithstanding different rates of profitability. So, in Lebanon, two out of four of the P.S.C. main components, are biddable, i.e., the cost recovery limit and the profit sharing. Lebanon has decided to have also a biddable work program. Work program bidding is primarily used for affecting the quality and level of exploration in an area. It's a means in order to control that the I.O.C.s work on time and with good quality results. Of course, excessive working commitments on the shoulders of the I.O.C.s risk increasing excessively the extraction cost of every single unit. It's also not advisable that companies propose grandiose working programs, not related to an efficient exploration, because, in doing so, they will add relevant costs to the project in the end reducing the quantity of available profit petroleum. In general, after a while, an excessive working commitment forces the parties to the contract to a renegotiation. If Lebanon desires to move on with its offshore gas potential it has to approve quite soon the two decrees. In specific, the decree related to Lebanon's E.P.A. is of paramount importance for the interested I.O.C.s in order to understand whether it may make sense for them to invest in Lebanon. The L.P.A. has provided some elements concerning the P.S.C.s that it has decided to implement; at a preliminary analysis Lebanon future P.S.C.s seem very in line with today's standard P.S.C.s. implemented across the world. At the same time, it is difficult to have a complete evaluation of the proposed E.P.A. because some elements need to be clarified. Moreover, only the auction will permit a complete assessment; in fact, the auction will tell Lebanon how the I.O.C.s intend to invest in relation to the biddable elements (cost recovery limit, the profit sharing and work program). When analyzing a P.S.C., in reality, it's the overall fiscal package that matters for both the government and the I.O.C.s. If one parameter is excellent, but then the whole picture is blurred, it's not helpful. Especially during the current difficult petroleum markets, Lebanon has to propose a fiscal framework with progressive elements capable of balancing the interest of the government on the one side, and the interest of the I.O.C.s on the other. Some companies are currently investing in both Israel and Cyprus, and it's probable that, without the war in Syria, some other companies (probably Russian) would be investing in Syria's waters. This indicates that all of these countries, Lebanon included, have a good hydrocarbons potential. There is really no need for none of these countries to start a 'race to the bottom' in order to increase its attractiveness for the energy companies. But, at this point, after all of the activities performed in the previous years, if the Lebanese government is serious about developing an offshore natural gas industry, it has to pass the two decrees and to give the green light to possible investors. If, on the basis of purely economic considerations — for instance among them: excessive extraction costs, the impossibility of exporting the natural gas unused locally, the present turmoil in the petroleum sector, the scarce interest from the side of the I.O.C.s, or even the preference for developing Lebanon's onshore petroleum sector — the government does not want to develop the sector, or if it wants to postpone the offshore project, it has to state its decision in a clear manner. The current limbo, mixing hope and scant determination, is of no avail for the overall development of Lebanon's economy. Lebanon's delimitation of its E.E.Z. is a classic example of a messy procedure that in the end has permitted Israel to try to move north its sea border with Lebanon. Initially, in 2007, Lebanon established the delimitation of its E.E.Z. with Cyprus along six equidistant points from north to south with the possibility of additionally extending Lebanon's borders north and south. Later, the Parliament did not ratify this agreement, and in 2009 the council of ministers adopted a more precise second delineation, whose new extended geographic coordinates (with extended north and south limits in order to have triple-point borders — with Cyprus and Syria in the north and with Cyprus and Israel in the south) were passed to the United Nations in July and October 2010. Lebanon's new delineation was based on the legal recommendation of Unclos. It's not difficult to understand why Lebanon did not immediately state the final dimensions of its E.E.Z. : The difficult relations among the involved countries are certainly the primary reason. But, bilateral negotiations are not the best way to trace borders involving more than two countries. 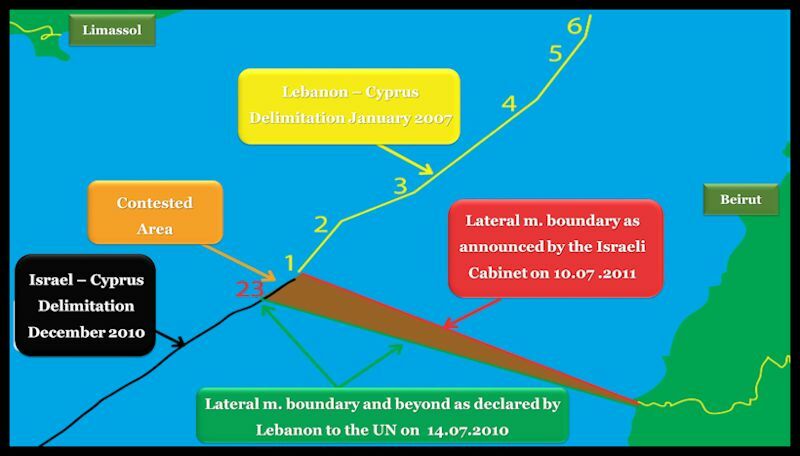 In fact, when in December 2010 Cyprus and Israel agreed on the their borders, they did not consider the mechanism for extending north and south Lebanon's E.E.Z. according to the bilateral agreement between Cyprus and Lebanon of 2007. Later Israel sent the coordinates of its E.E.Z. to the U.N. despite the overlapping of 874 square kilometers with Lebanon's E.E.Z. In sum, this is the essence of the problem between Israel and Lebanon in relation to their overlapping E.E.Z.s. A final consideration, if, on the one side, Lebanon could have probably acted in a more consistent way in order to state the borders of its E.E.Z., on the other hand, it's also true that Israel's claims are, legally speaking, not particularly well substantiated.